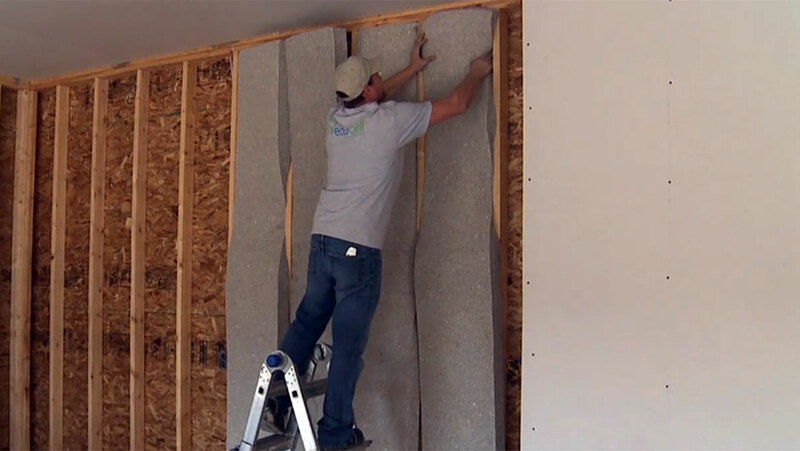 ECOCELL batts are commonly installed in sidewalls of residential or commercial structures, but can also be installed in rim joists, attics, floors or other hard to insulate areas. Easy to handle and install, ECOCELL batts are Class A fire rated and non-irritating. ECOCELL batts meet or exceed ASTM testing for both commercial and residential insulation. Manufactured for a tight, friction fit, ECOCELL batts do not require any special equipment to install. ECOCELL products also contain an EPA registered fungicide to resist the growth of mold. ECOCELL batts are not only superior thermal materials, but also acoustical performers. ECOCELL batts control and deaden sound due to the density of the cellulose fibers and the non-woven manufacturing process. This unique design also reduces airborne sound transmission from room to room and blocks outdoor noise for a noticeable quietness. ECOCELL batts contain a minimum of 70% recycled content. ECOCELL products are made from a combination of recycled and renewable fibers, the majority of which is post-consumer recycled newspapers. The manufacture of ECOCELL products produces zero scrap. In addition, customized recycling programs can be set up to recycle ECOCELL products.